Chapter 7 bankruptcy is a legally protected method to liquidate one’s debts and start over with a clean financial slate. However not everyone qualifies for Chapter 7. Bankruptcy laws across the United States, including Texas, come with means tests for those who apply. The means test is a tool used under the U.S. bankruptcy code to determine if an individual or married couple qualify for Chapter 7 bankruptcy relief. 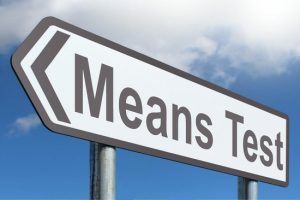 The means test is a simple tool to look at, but there are many details, factors, and nuances that come into play in determining why and if a client qualifies for a Chapter 7. Different types of debts, personal health issues, business debts and more can all come into play in overcoming “the presumption of abuse” if one does not immediately qualify under the means test. The Texas means test compares the applicant’s household income to the Texas median income. Average household income is determined by averaging monthly income over the last six calendar months, and then multiplying that figure by 12. For example, if a single applicant with no children makes less than $47,238 per year, they immediately pass the means test. A two-member household must make less than $63,148, a three-member household must make less than $69,294, and a four-member household must make less than $78,572. Congress overhauled U.S. bankruptcy laws in 2005, passing the Bankruptcy Abuse Prevention and Consumer Protection Act. The Act contains several provisions intended to discourage Americans from filing bankruptcy when they could still repay their debts. The means test was among those provisions. When an applicant makes more than the median income for their household size, they must overcome the “presumption of abuse” by proving the specific reasons why the applicant still can’t pay their debts despite their income. Those reasons can include serious medical conditions, recent job loss or income reduction, active military duty, recent divorce or other special circumstances. Applicants must calculate their current monthly income and expenses. This includes business and rental income, interests and dividends, pensions and retirement plans, unemployment income and money paid by others towards the client’s household expenses. Household expenses include those necessary for health and welfare (food, housing, utilities) and any payments you are legally obligated to make, such as back taxes. Though median income levels vary by state and household size, one factor is clear: the more disposable income your household has, the more you are expected to pay to liquidate your debts. Whether you pass the means test to file Chapter 7 bankruptcy or other options are better for you, the experienced attorneys of Allen Stewart, P.C. can help you find the best solution for your financial woes. Contact Allen Stewart, P.C. and let us help you find financial stability today.